Last holiday season, while awaiting my flight in a Cincinnati airport, I saw a soldier in line to get a seating assignment. There was nothing special about this soldier apart from the fact that his fatigues made him stick out rather than blend into his surroundings. No family members were with him, and his camouflage was a pattern of desert hues, suggesting he was on his way home from a Middle Eastern conflict zone. But where, I wondered fleetingly. My attention snapped quickly to the television, where a CNN update announced new statistics about the foreclosure crisis. The numbers confused me, but the tone was grim. 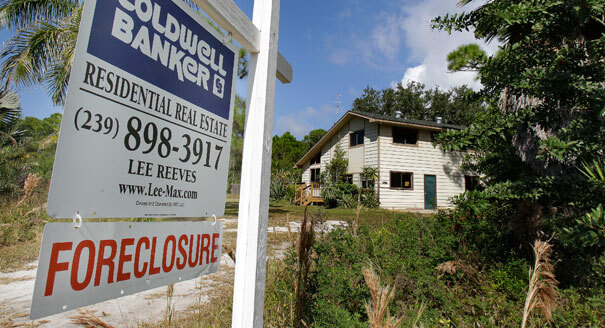 Americans were losing their homes at an accelerated pace. Still sitting in the greasy terminal seat — somebody's "i-device" thumping music, another person's airport food wafting in my nose — it came to me in a vision. I saw a crystal-clear image of a typical American home, straight out of a Norman Rockwell illustration, but with boarded-up windows, an unkempt lawn and a foreclosure sign out front. On the steps of the home, a woman and child were standing in anticipation. On the walkway, frozen in disbelief, was a soldier in desert fatigues, a rucksack on his back and a duffel bag at his foot. Upon returning home, I decided to make an artwork out of this vision because it is at once simple and complex: simple in imagery (house, woman, man, child), complex in detail and significance (boarded-up windows, foreclosure, soldier, war). As an artist, I find it important to express ideas that reflect the society in which I live, so I made some preliminary sketches to capture the vision before memory deleted it. These sketches evolved into an original sculpture and rubber mold. I then cast five copies in plastic resin and painted the casts by hand, with help from two assistants. Although "Welcome Home Soldier" is a work of imagination, it is anchored in truth. With a large number of citizens having been effectively ejected from their homes during the past six years, my generation no longer looks at the home as a family's greatest asset — in many situations, it has proven to be the greatest liability. And under these housing conditions, men and women in the armed forces are returning home from war, some after nearly a decade in rotation. For some soldiers, the homes they left behind in 2001 and 2003 are not the homes they are returning to in 2012. "Welcome Home Soldier" is an allegory for this new American reality. Leon Reid IV is a Brooklyn-based public artist. 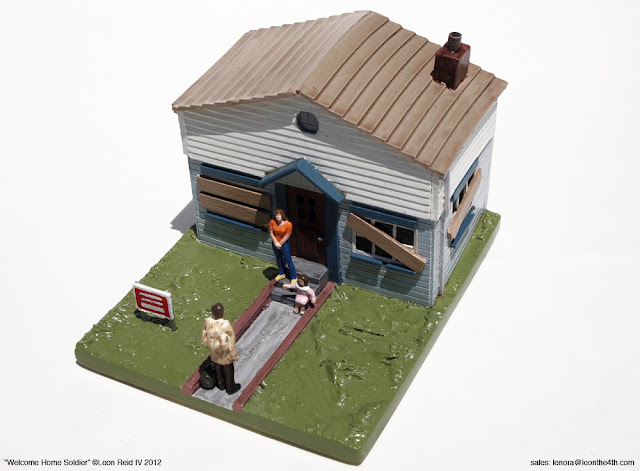 His recent sculptures include "The Hundred Story House" and "Hot Off the Press." This is a captivating piece. I'd like to buy a caste as a reminder of the injustice in propping up an industry where people knowingly take advantage of others as a way of life. At the very least, people who put their lives at risk to serve their country deserve the right to quality housing without being left in overwhelming debt.